The Garden Company & The Pool Company are a dynamic, progressive multi-award winning landscape and pool construction company. Based in Melbourne, we service all areas, ranging as far as the Mornington Peninsula. 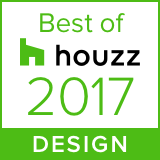 The Garden Company has recently recieved Best of Houzz 2019 for design. This means our portfolio was voted most popular by the Houzz community! Thank you to all who voted, it means a lot to all of us here. Check out our Houzz profile for more photos and reviews. How Do I… Choose Natural Stone Pavers? Some great information in this article by Eco Outdoor, speaking about the benefits of using natural stone on your project and giving advice on the many available options. We were excited to see that our stunning Wheelers Hill project has been featured in this. How Do I… Choose Natural Stone Pavers? The end result was far more than we ever expected. Dave & Simon were extremely informative through out the process, they were always keeping us up to date on where things were at and the quality of their work is second to none. We were over the moon with the completed work. We now have a negative edge pool that overlooks all of the surrounding hills. The balance and positioning of where the pool is located on the hill is perfect and it allowed for us to add in a decent amount of paving around the pool for entertaining. The Pool Company came out for a consultation and offered solutions on how to modernise the look of our 70's pool whilst still keeping to budget. We’ve had friends over recently and they cannot believe it’s the same pool. The	Garden Company & The Pool Company are a dynamic, progressive multi-award winning landscape and pool construction company. Based in Melbourne, they service all areas, ranging as far as the Mornington Peninsula, right through to the Bayside and Macedon Ranges. They specialise in all facets of landscaping and pool building as well as offering in house landscape & pool design.